This multi-purpose container holds water or solvents and comes with a lift-off lid to prevent evaporation. Convenient openings of various sizes surround the rim to allow brushes to stand upright. 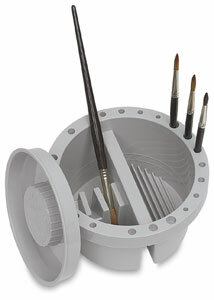 Brushes can rest in the liquid on one side while the ridges on the bottom of the other side aid in cleaning the brushes. The tub measures 5½" (14 cm) in diameter. Made of unbreakable plastic.